One of the joys of home educating - doing it in one's dressing gown and a cup of coffee in one hand! The morning began with me coaxing Rye to use the pencil grip aid - it's a simple enough wee gadget, elastic that goes over his wrist with a short loop that goes over the end of his pencil, so it encourages him to hold the pencil at the correct angle; and then there's a wee football charm that he holds in his fist with his middle, index and little fingers, the pencil itself he pincer grips between his forefinger and thumb. This alongside with reminding him to angle the paper so it was comfortable for him to write, made a massive difference to his writing. 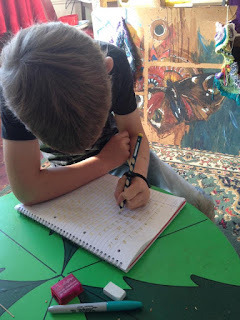 He wrote a page of numbers, then made up his own sums and wrote those down too, followed by writing a page from the Science Encyclopedia on the Sun. After a rewarding mouthful of chocolate, we went on to review the past lesson on Proper Nouns, and then I read a fable to Rye and he answered questions that checked his comprehension, along with many reminders to answer in a complete sentence. The Classical Education books, are fabulous and save me a large chunk of time I would otherwise need to spend researching activities and books for literacy and language. Anyway, that brought us nicely to break time; juice and toast for Rye and coffee and toast for me - I'd gotten dressed while he was doing his handwriting practice. 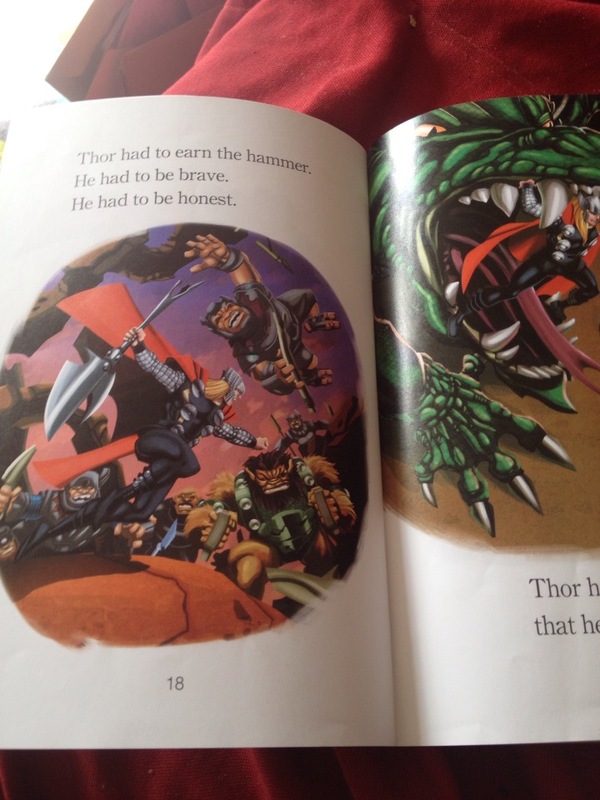 Once refreshed, Rye read about half of Thor to me. 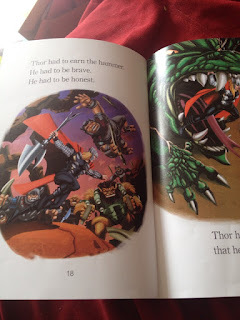 I think though it's time to move onto some other books for a while - apparently another common dyslexic trait, is using the pictures as a visual reminder of the story; so while he can seemingly read words like "hammer", "beasts", "monsters" seen out of the context of this story, he wouldn't know what those words are. Still he did do well, showed that he was considering the context of the sentence, and using the pictures appropriately to help him work out words, and trying to sound out words. Mind, at one perplexing point, he started reading "had" as "did", I kept saying "try again, it begins with a "h"" but he still kept saying "did". Rye tends to see the shape of word, again a dyslexic thing, so while it seems daft to me that he's mixing up "had" and "did" in terms of word shape, they are similar. So, as he had read quite a bit up to that point, I suspected reading fatigue was scrambling his brain. We stopped at that point. We had another chat too, about remembering to look properly at the word and the letters that make up the word - not just the shape. Next was history. Looking through the History Encyclopedia. Funny isn't it, we began the Space Project because I had this idea we could incorporate, science, math, handwriting, reading, history, geography, natural studies etc all into one super project, and have lots of interrelated strands. 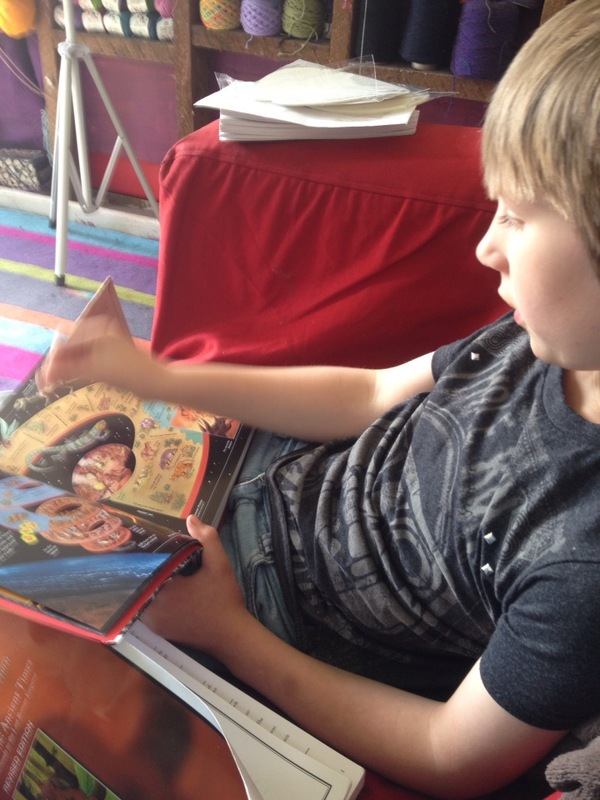 Rye doesn't want to work just on a space project, even when we are covering lots of different things and he has a lot of autonomy - he is a boy who does enjoy mixing the freedom a project allows with more traditional learning methods. 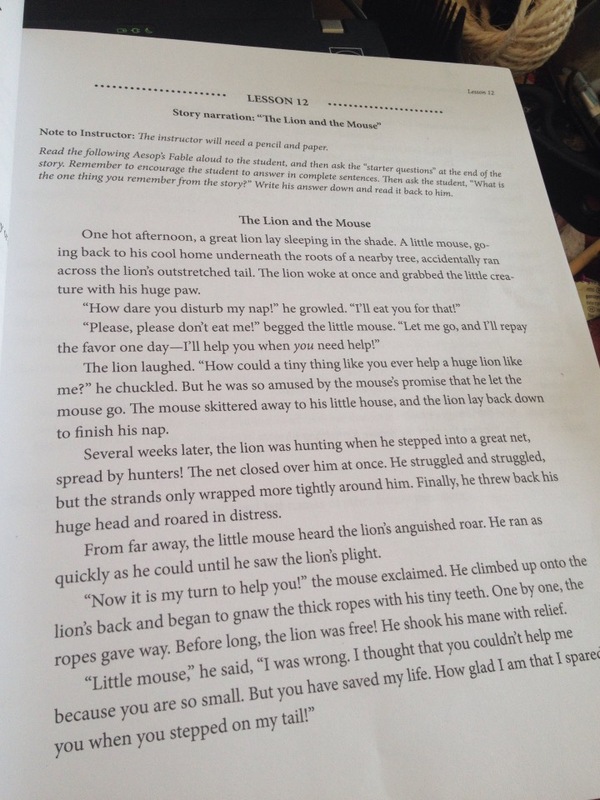 So, I've dug out our Story of the World Book 1, and read to him the introductory chapter that explains what an historian is and how they learn about people's pasts. 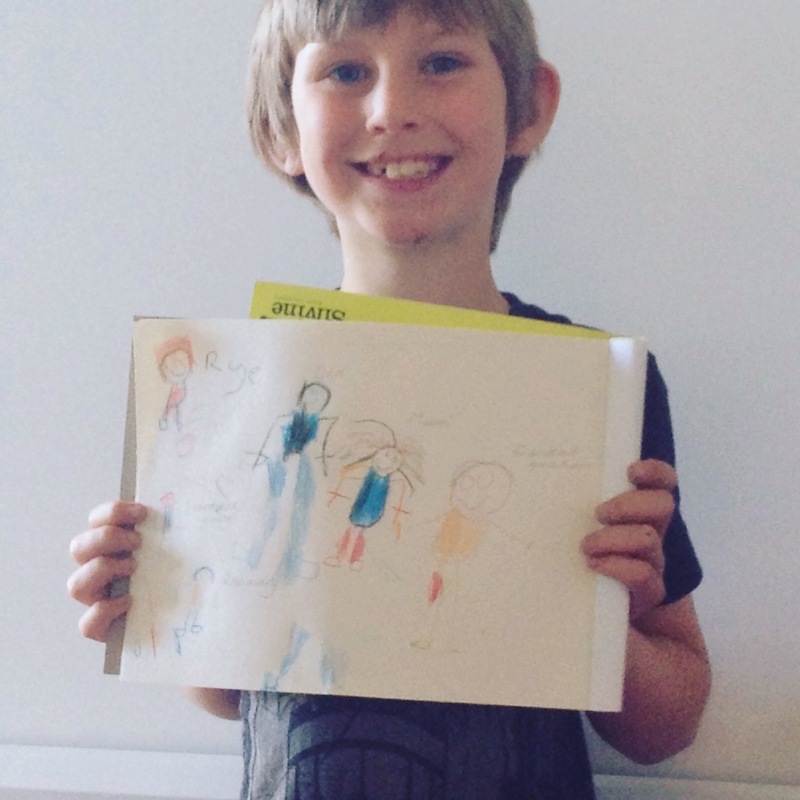 One of the activities in the history work book was to create a family tree. 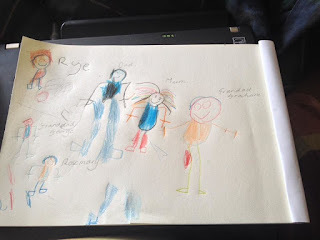 I'm out of ink for my printer at the moment, so I'll have to photocopy the sheets for building up the family tree later, so instead I suggested he draw a picture of his family. So cute, see me, with my colourful dreads. 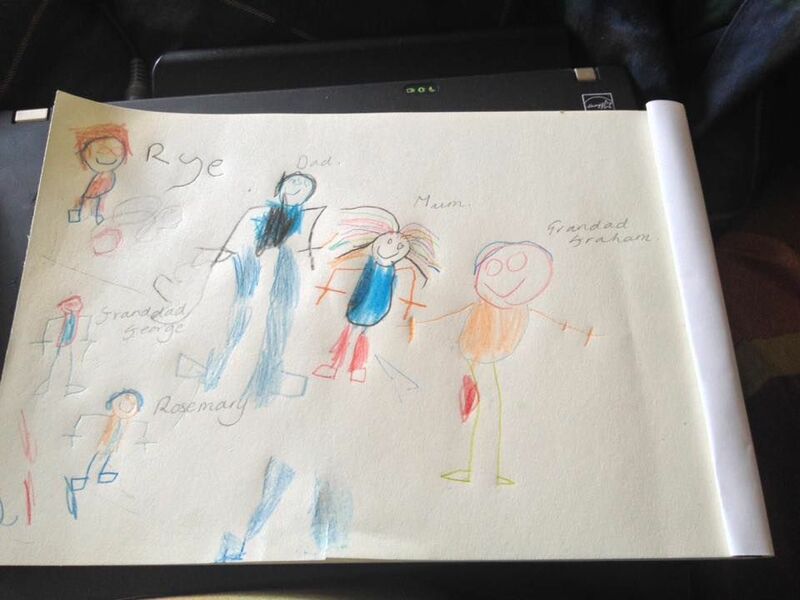 Rye drew his Great Granddad George, Granddad Graham, Rosemary, his dad and me, oh, and of course himself. 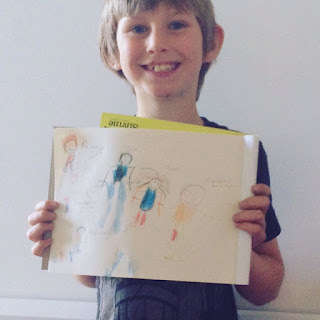 Took him a while to get his head around the task, but once he got past being harsh about his drawing skills, he really enjoyed the task. He worked hard, and he knows he accomplished a lot today, and felt really good about himself. 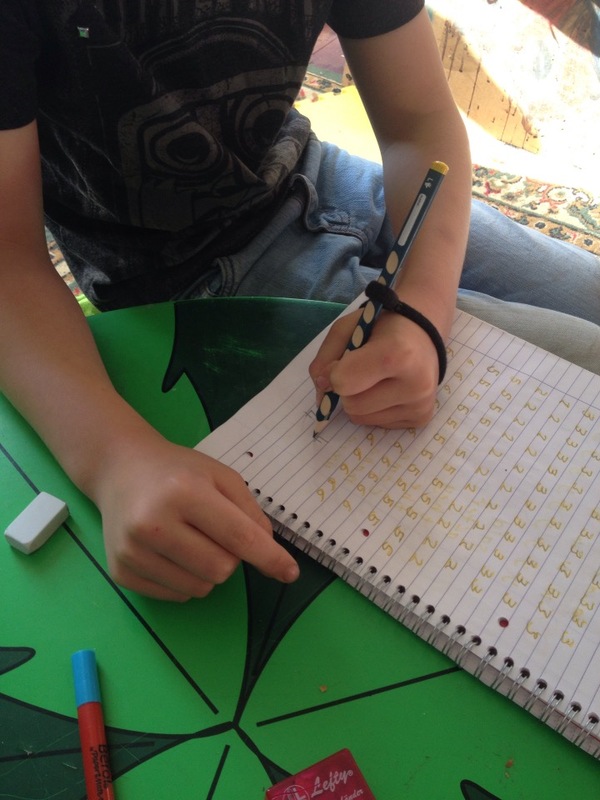 I had planned to do some maths, but as it was already lunch time, I decided that was enough for now, and he did kinda set himself sums during his handwriting practice. The afternoon was spent on lego, a video game, and playing with his house friends. During dinner I read the next chapter of the "Goblet of Fire". Thursdays is also house meeting night, so after settling him with a screen, to the meeting I went. This coming weekend is a work weekend for the Co-op, working on the windows to ensure they have a long life, and maintaining the access ramp to the garden. It does mean I need to do some preparatory work tomorrow. This is the beauty of home ed, and sometimes the difficultly, juggling various life needs and commitments. The vague plan I have in my head at the moment is for some math work in the morning for 30mins to an hour, depending on how Rye responds to the tasks, then he can help me with the work I need to do in preparation for the work weekend. And if not too shattered from that, maybe a game of fiddlesticks - it's a reading game, I'll explain more tomorrow.